"Ten years covers a wide span and a variety of thinking. 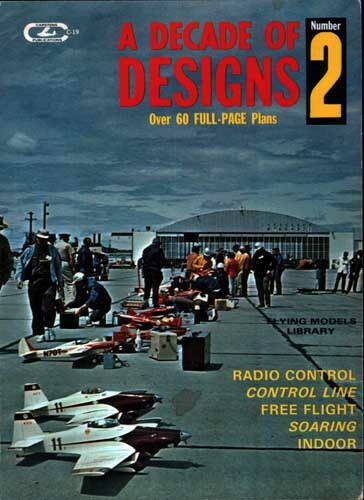 Here are flying model designs covering virtually every type of model aircraft that can fly: radio control, control line stunt and combat, free flight gas, rubber, sailplanes, and even several helicopters." Second edition of Decade of Designs No. 2 (first edition published in 1966). Over 60 full-page plans, a compilation of designs featured in FM from 1956-1966. Edited by Robert Buragas, formerly editor of Flying Models Magazine. Part of the Flying Models Library series.